After the one day holography conference yesterday, I and others have a feeling holography is bouncing back. I can’t put a finger it, but there is definite interest from museum and gallery folk, and there is an air of confidence amongst holographers. I have not seen this in the last 20 years. Let’s hope it continues. We might have some exciting times ahead. 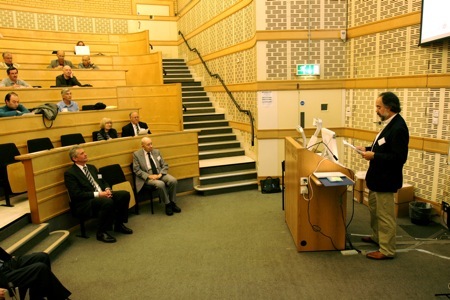 Picture shows Jonathan Ross inaugurating the conference. Seated in the front row are Graham Saxby and Martin Richardson.